Hopping aboard a vision of our self-flying mobility future a few years ahead of schedule. After decades of aspiring to take the controls of a helicopter, I finally achieved my dream last month. It was no rickety trainer, either, but a brute of a twin-engine, 12,000-pound Sikorsky S-76, a commercial chopper used around the world as an oil rig transport, search-and-rescue tool, or cushy flying limo for VIPs. It’s a workhorse, stuffed with panels of switches, dials, and buttons. All of which I dutifully ignored. In fact, I never even bothered going to flight school. All I had to do was whip through about 45 minutes of instruction in a motor coach parked next to the aircraft at Sikorsky’s Stratford, Connecticut headquarters. After a few demonstrations on a simulator, I signed some releases, sat obediently through a preflight briefing, then marched out to the shiny blue aircraft with my co-pilot (an actual test pilot named Mark Ward) to become the first journalist to actually “fly” an autonomous helicopter. Though still a work in progress at the moment, the sophisticated automated flying technology I was about to use could prove essential to future mobility, enabling many visions of personal aviation and on-demand electric air taxis. Pilots are already in short supply across all categories of aviation, so these future aircraft will need to be either flyable by pilots with less training—with the computer managing the harder stuff, or stepping in entirely if things get messy—or able to fully execute missions themselves. They’ll need to map out their own paths, communicate with air traffic control, and avoid everything from power lines to birds to jumbo jets. All that, of course, as well as actually fly the aircraft—that is, successfully control its movement through the sky in accordance with all the rules of physics and aeronautics. Ratcheting up the challenge still further is the fact that helicopters and the other vertical-lift configurations being explored—multi-rotor, hybrid fixed-wing and rotor, etc.—are far harder than conventional airplanes to render autonomous. Airplanes typically follow very straightforward takeoff and landing patterns into known airports, but vertical-lift aircraft must, among other things, be able to manage tricky landings and takeoffs in tight settings such as amid trees or on urban rooftops, with wild gusts of wind buffeting them from every direction. The many companies developing air taxi vehicles these days are learning precisely how difficult this is right now, but at the moment, Sikorsky is the world leader in this capability, thanks to the "Matrix Technology" system being tested aboard this S-76. 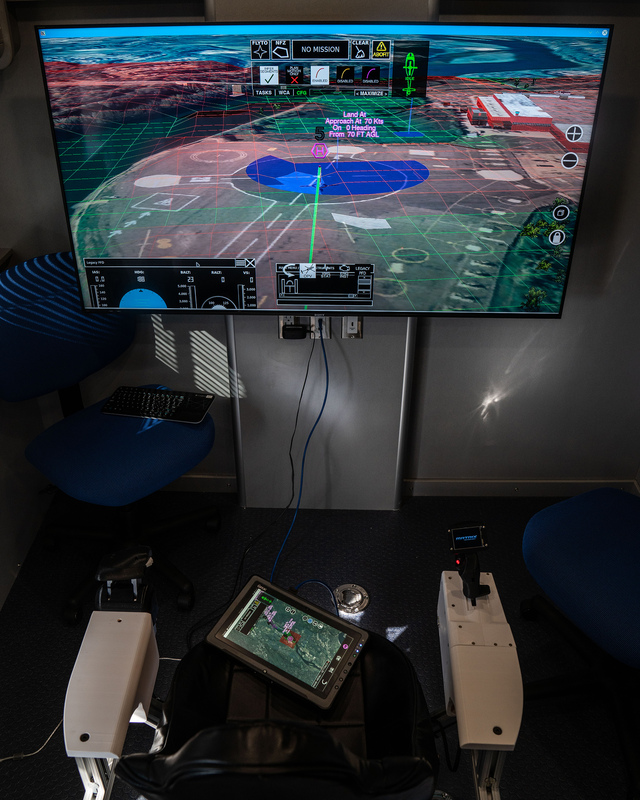 Dubbed "SARA," for Sikorsky Autonomy Research Aircraft, the helicopter is the centerpiece of the effort, which was announced in 2013 and has since accumulated more than 300 hours of autonomous flight. Sikorsky’s immediate goal for Matrix focuses on reducing pilot workloads and improving safety in a variety of current helicopter settings, from routine flight to nighttime search-and-rescue missions at sea. Future urban mobility is very much on the company’s radar. Indeed, Sikorsky will announce its intentions to enter in the urban air mobility race this week, at an industry gathering in Atlanta called Heli-Expo. It will be bringing not only its autonomous-flight capability to play, but also its data-gathering systems—useful for monitoring the health of aircraft around the world—and the experimental electric propulsions system it has been developing since 2008. But the autonomy really meets the air with Matrix, which is what I’m here to try out aboard SARA. The system uses external cameras, multiple long-range LIDAR scanners, and a variety of sensors to constantly monitor the helicopter’s surroundings and movement. Complex algorithms process the data and control SARA via servos connected to the main rotor, the speed and pitch of which determines its upward and lateral movement; the tail rotor’s speed rotates the fuselage around a vertical axis, a.k.a, yaw. The aircraft has just two seats, with the rear spots having been ripped out and replaced by test equipment, sensors, and control servos. (The actual flight-control computer itself represents just a fraction of this, as it now fits into a space roughly the size of a breadbox.) 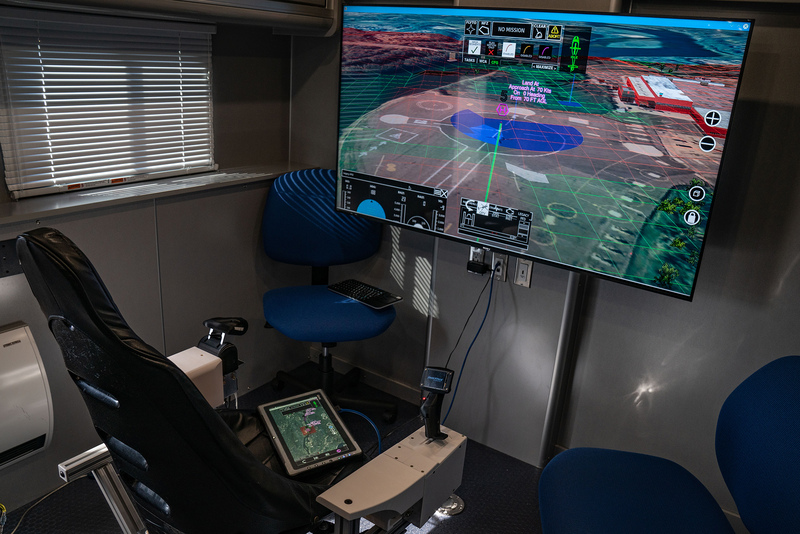 The pilot—or in my case, “operator”—interacts with the helicopter via a tablet computer, which shows the helicopter’s position on a map and allows the user to execute a complete flight through basic commands. After we boarded and buckled ourselves in, Ward started the helicopter manually—with twin turbine engines, this is still a multi-step, checklist-intensive process—and taxied us into position. We waited for a brand-new UH60 Black Hawk helicopter to taxi past us for its maiden flight, and then the controls were mine. The mission was simple: Lift off and hover at 60 feet, reposition the helicopter at two different points on the airport, then fly off to a location about 10 miles away before returning for some additional maneuvering. The tablet interface is still mostly designed for professional pilots, since they’ll be the first users; as such, it uses the lingo and graphics of conventional aviation—headings, approach and departure angles, hover altitudes. But once you’ve entered your rough flight plan—either via a single tap or by inputting a sequence of waypoints—executing the flight is a simple as hitting a button. Our first goal was to establish a simple hover at 60 feet; I tapped the button and the S-76 lifted smoothly off the ground, with no input from Ward, before stopping at 20 yards up. At this point, I was able to control the helicopter with the two hand controllers—a joystick on the right that moved the Sikorsky forward, backwards, left and right, and a controller on the left for yaw and engine power, which adjusts altitude. These are present to allow pilots to fine-tune the flight as needed, such as when executing a rescue or inspecting a power line. Pilots can use them at any time without manually deactivating Matrix, and the system keeps functioning in the background ready to either maintain the current movement or continue along the prescribed path. I guided us toward a landing pad on one side of the heliport with no fuss whatsoever, and then toward another on the other side, easily rotating the helicopter around to face different directions. It was, to be frank, a lot like a video game, with all the actual difficulties of helicopter control stripped away like I’d clicked the box for "easy" on the start-up menu. To be clear: Flying helicopters is extraordinarily difficult, with beginner pilots requiring hours of training to simply learn how to maintain a steady hover, let alone shuffle across an airport at 60 feet. With Matrix, I did it instantly. With it time to leave Sikorsky’s headquarters, I tapped the button for the remote destination and altitude of our destination. The helicopter instantly mapped out a path to make it happen and sent us on our way, showing both the ideal path and the one it determined was most appropriate given the fuel, wind, and aircraft loads at the time. When the S-76 came to a stop 1,500 feet above our designated waypoint, I maneuvered us around the air as easily as I’d done back at Sikorsky’s heliport. Even at high altitude and with stronger winds, the helicopter remained steady and responsive, moving in whatever direction I asked; I banked easily above cell towers, maneuvering across the landscape like a grizzled Huey-driving veteran. There was no wrestling with sensitive controls or struggling to maintain position—the helicopter did everything. In many ways, the challenges facing autonomous aviation echo those facing autonomous ground vehicles: both must master the “rules of the road”—the mechanics of movement and their integration into traffic—but they also must sort out how to deal with so-called "edge cases," those uncommon situations where fast judgement is required, whether it’s disappearing road markings on the ground during a snowstorm or uncertainty about whether that’s a cloud on the horizon or smoke from a forest fire in the air. Other differences would seem to set them apart, though: Autonomous cars have to deal with essentially and endless barrage of threats—other vehicles, pedestrians, merges, construction zones, even curbs; while aircraft don’t have to deal with menaces quite that close and frequent, they do have to deal with things like unpredictable winds, trees, bobbing landing pads on ships, and many other risks. For that reason, Cherepinsky says, they’re also taking a different approach in developing the artificial intelligence that will enable autonomous flight. Whereas autonomous car programs are using machine learning to train cars over millions of miles to manage every conceivable challenge, Sikorsky is instead simply telling the aircraft what to do in each case. For their needs, it’s faster and more precise. After a little while hovering about, Weld and I had to spin SARA around and head back. With a few taps on the tablet, the S-76 turned smartly toward Sikorsky’s headquarters, following the river while gradually descending during our approach. We settled in above the landing area; I puttered around a little more, then told the autonomous flying machine to land, prompting the helicopter to settle on the ground with grace and precision. In the future, versions of this system will be even simpler than what I experienced—with interfaces designed to allow operators with zero aviation knowledge whatsoever to simply tell the computer where they want to go via touchscreen input or voice controls. It will steer clear of danger, follow the rules of the sky, and respond instantly to danger—whether in the shape of other aircraft, birds, or errant gusts of wind. Until then, though, it will simply make helicopter pilots’ jobs easier and safer. Sikorsky plans to begin rolling out the features into its current aircraft within a few years—first on the larger S-92 helicopter, which will receive autonomous landing technology to aid in dicey offshore oil-rig landings, search and rescue roles, and assorted industrial applications. Many of the companies claiming to be launching air taxi services say they’ll be ready by the mid-2020s, with systems incorporating human pilots with only modest training needed. When asked whether Sikorsky will be ready for that level of service on that timeline, Cherepinsky responds confidently. “We’re ready now,” he says. The service is now looking at using the unmanned ships as electronic warfare platforms to blind and distract opponents. Hurdles still lie ahead, but the program seems to be making progress towards its goal of replacing all 11 VH-3Ds and 8 VH-60Ns by 2023.